Over at The Name Station, there is an article quoting two studies which demonstrate that Kevin is the worst possible name to have in Germany. For some reason, this name really gets up the noses of Central European schoolteachers and cyber-daters. As it turns out, the Germans aren’t exactly Robinson Crusoe in this regard. According to Lou at Mer de Noms (niece of a Kevin), the French also look down their noses at the name Kevin, and say, Non, non, non! Across the Channel, Kevin is considered a chavvy (bogan) name, to the point where kev is a synonym of chav, innit? And if we hop over the Pond, American TV shows such as Daria and South Park depict Kevins as either dumb jocks or disposable meaningless characters. Oddly enough, in the United States Kevin is disliked for the exact opposite reason as in Europe – far from being too lower-class and urban, Kevin is seen as too middle-class and suburban. A persistent Internet rumour is that the name Kevin is banned in Mexico because it will lead to “teasing and ridicule”. Actually the Chihuahua state government forbids parents from using any non-Spanish name without a Spanish middle name, and for some reason, reporters always seem to use Kevin as an example, hence the confusion. That may say more about how the name Kevin is viewed by the reporters than how it is in Mexico. Apparently vast tracts of the Northern Hemisphere are infected by an intense loathing of people named Kevin. Here, another group who has joined the We Hate Kevin Club is the Australian Labor Party Caucus, who on Monday morning voted against Kevin Rudd’s bid for the leadership, two votes to one. So much do they detest Kevin Rudd that they profess a preference to losing an election without Rudd than winning one with him. Their vote in support of Julia Gillard is not so much a ringing endorsement of her leadership as it is a sign of their determination to vote for ABK – Anyone But Kevin. 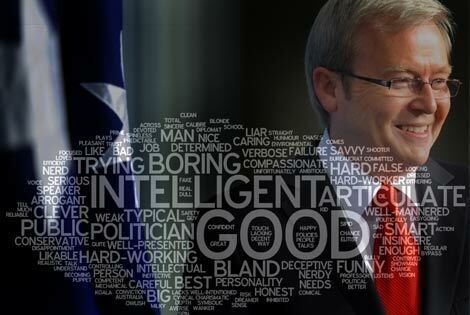 Kevin Rudd was elected Prime Minister of Australia in a landslide victory in 2007, his supporters running with the slogan Kevin ’07. Soon his non-stop work ethic led to him being labelled Kevin 24/7, and his frequent diplomatic trips around the world Kevin 747. Some papers sneeringly called him Kevin 7-11 for catering to the public a little too readily, like a convenient corner shop, and rumour had it he was Kevin 007 – a double-agent leaking information that could damage his enemies. However, his authoritarian work style and biting insults made him anything but loved by his Labor colleagues, who ousted him the minute his popularity slipped in the polls and replaced him with his Deputy, Julia Gillard. This was all done so quickly that Rudd supporters have some basis for seeing him as stabbed in the back, as happens so often in the workplace. Since his dumping, there has remained the vague threat (or hope) that he would one day rise up and take back his power. When Julia Gillard’s own popularity plummeted to record lows, he suggested he might run for party leader (and thus Prime Minister). Polls done in the lead-up to Monday morning’s ballot showed great public support for Kevin Rudd, with the majority of people preferring him to either Julia Gillard or Tony Abbot, the Opposition Leader. The Pro-Kevin lobby reached fever-pitch. He was treated like a rock star wherever he went, received messages from people all over the country in his support, and was proclaimed the People’s Prime Minister. However, the people’s support is useless without the support of your party. That’s politics. Maybe the Germans, the French, the British, the North Americans, and possibly the Mexicans can’t stand Kevin, but it seems Australians are pretty okay with it. We elected a Kevin Prime Minister, even though Dame Edna Everage expressed some doubts about the idea (she was probably catering to the anti-Kevin prejudices of her chiefly British audience). And even though he’s gone, he was never voted out, and clearly a sizeable chunk of the population would like him back. The media love the name Kevin as well – it’s so useful for catchphrases and headlines. Not only Kevin ’07, Kevin 24/7, Kevin 747, Kevin 7-11 and Kevin 007, but also in the headlines were Kevingate, The Kevinator, Good Heaven’s It’s Kevin, Kevin Heaven, Kevin in Heaven, A Kevinly Sign from Above, Knocking on Kevin’s Door, and Kevenge (an act of revenge committed by someone named Kevin). Australians have never had problems with names of Irish origin (as the list of Famous Names is starting to make pretty obvious). Kevin is the Anglicised form of the Irish name Caoimhin, a form of the older Cóemgein, which can be translated as “gentle” or “handsome”. Saint Kevin is the patron saint of Dublin, and is sometimes called the Irish St Francis of Assisi for his love of animals and nature. According to legend, an angel turned up at his baptism and instructed that he should be called Kevin, which the bishop naturally felt obliged to go along with. Maybe Kevin truly is a name from heaven? (A more plausible tale is that his name was bestowed upon him by fellow monks in tribute to his sweet nature). In Australia, Kevin is a classic name which has never left the charts since record-keeping began in 1900. It first joined the Top 100 in the 1910s, and peaked in the 1930s at #6. It remained a Top 100 name for nine decades until the early 2000s, when it just dipped out at #101. Currently it’s #154. In Queensland, which is Mr Rudd’s home state, there were twice as many babies named Kevin last year than babies named Julia, his deposer. And I have noticed in the birth announcements how common Kevin is as a middle name for boys. Are they being named after a father, an uncle, a grandfather … or a lost Prime Minister who may still return, like the once and future king? Rudd Redux? NOTE: Kevin is a Top 100 name in at least nine different countries, two of which, France and the United States, supposedly despise it. Go figure. Maybe this whole anti-Kevin thing is a beat-up. All the Kevins I know are awesome. I do get the stigma, if it can be call a stigma, about the name Kevin. Its kinda there with ‘James, Peter, Matthew’ etc. but not as ‘mainstream’. Its a very normal name which is at the same time not very well travelled. If you’re stuck for baby boy names, just say Kevin. Its the all-rounder of names. In theory Kevin is just my style (I like dad names with a ready nickname) but in practice I just can’t like it. I find Calvin much more classic (but similar). I think ‘Big Kev’ did Kevin a lot of harm. If I hadn’t already gone over my word limit by heaps, I would have said some of the other famous Kevins, like Big Kev from the infomercials and Kevin Bloody Wilson. I must say I prefer Calvin myself, but Kevin certainly seems to be doing well as a middle name. I only knew one Kevin growing up. He was our schools heart throb. I don’t have any negative feelings for the name Kevin. Now Tyler, Evan and Ryan are a completely different story! Oh and I am 28 so maybe I missed the Kevin swarm? I’m not sure: I can only see Canadian records back to 2000 (oh and only BC). Canada seems to be discarding Kevin much faster than the US, based on just one state. I only knew one Kevin as well in high school – he was really nice and funny. I’m indifferent to Kevin. In my mind, Kevin is the American New Dad with kids under 10. He’s his 30s, and reasonably good looking with a mid-level manager job and a supportive, reasonably attractive wife. He lives on a cul-de-sac, drives a minivan and spends his weekends carting kids to gymnastics and birthday parties. And I could have just said Kevin was a cliche. In the U.S. the name is in decline, I’m surprised to see Kevin at 58 in 2010. Wow thanks so much for supporting my statements, re: US attitudes to Kevin; I think you basically summed it all up in just a few words. It is falling veeeeeeery slowly; it was stable in the #30s for over a decade (in US) and has really only just started declining in the last couple of years.